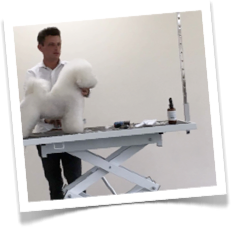 Richard was invited to judge at the Strictly Come Grooming contest in July 2017 a great honour to be invited to judge the purebred scissor categories and the workshop categories. 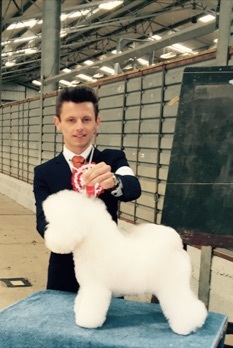 Also during the show Richard held a grooming seminar for other groomers on how to trim the Bichon Frise. 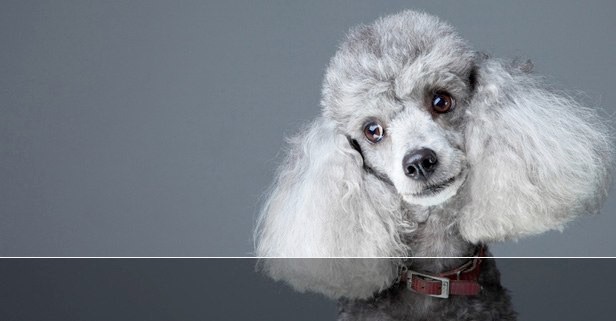 A great weekend of grooming was had. 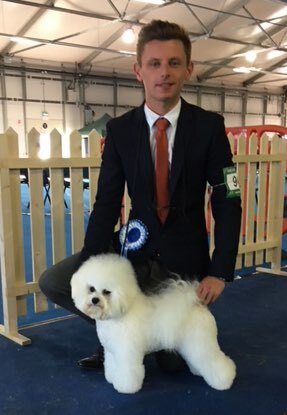 In June 2017 Richard prepared and handled the beautiful Sakura at the Three Counties Dog Show where they won best of breed, Toy Group 1 and finally Reserve Best In Show overall beating over 7500 dogs! What an amazing weekend. 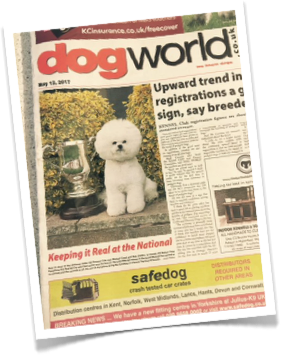 Our very own Andre appeared on the front cover of national newspaper Dog World after winning BEST IN SHOW at the prestigious Birmingham National Dog Show. 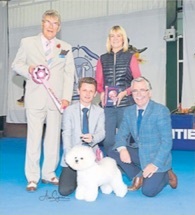 This show is held over four days with 11,000 dogs entered for competition – what an amazing win! 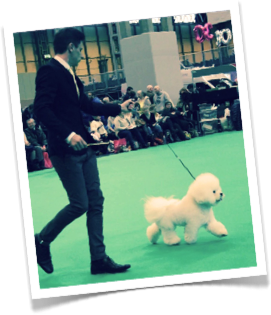 Below: 2017 and Richard accompanied Andre to this world famous annual event. 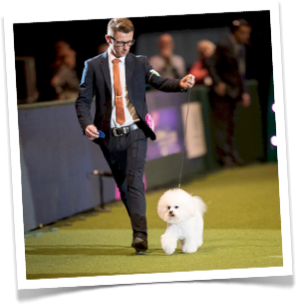 Right: Sophie on her way to winning a first at Crufts. 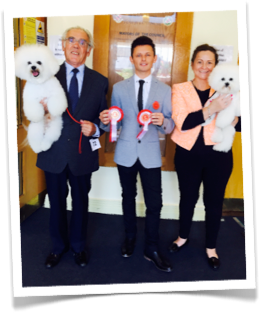 Richards choice for best of breed and best puppy in breed at the North Wales Toy Dog Society show where he had the honour to be invited to judge the Bichon Frise classes. 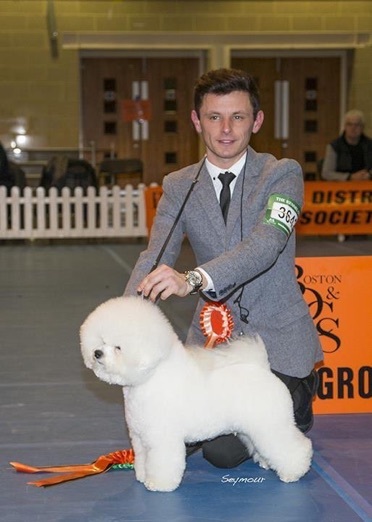 Andre winning best of breed and Toy Group 4 at Boston Championship dog show January 2017. 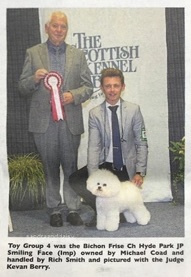 Toy Group 4 in Scotland in August. 2017. 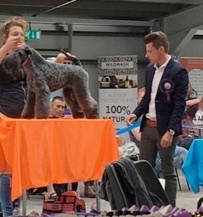 Right: Sophie wins Reserve Best Puppy In Show at the 2017 Belfast Championship.